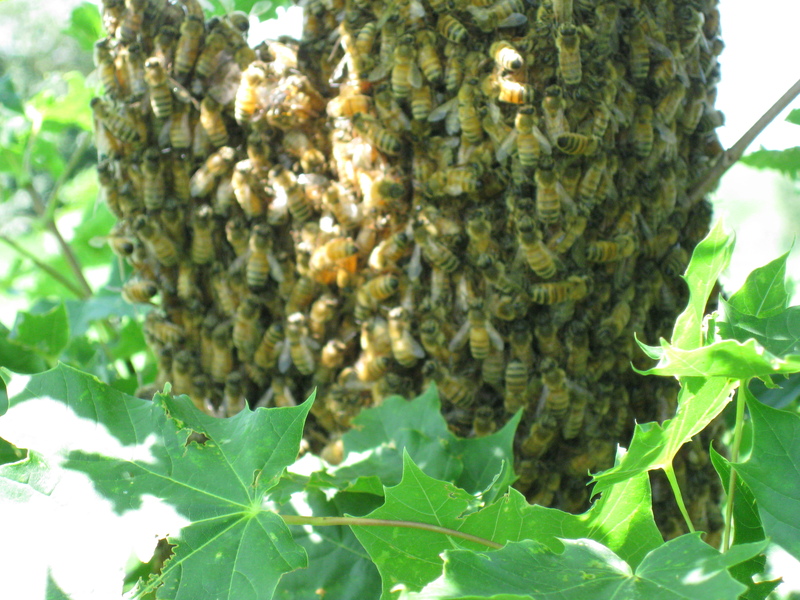 Swarm of bees in a tree in the yard, earlier this summer. This is only the third time I have seen a swarm. I got close to snap this picture, because I have heard that swarming bees are not aggressive. If they noticed me, I couldn’t tell. I looked up swarming bees on Wikipedia. When a hive becomes large enough to make new queens, the old Queen leaves with about 60% of the worker bees. They spend a few days scouting out new locations for their hive. I thought about trying to capture the swarm in a box, and starting my own apiary. By the time I worked up my courage, they had flown away. This entry was posted on Friday, October 1st, 2010 at 12:56 am and is filed under Curious nature. You can follow any responses to this entry through the RSS 2.0 feed. You can leave a response, or trackback from your own site. beautiful and amazing! Can you catch wild bees and ‘domesticate’ them? I remember that dad actually did this on the farm when I was a kid. There was a huge swarm in one of the trees and he called someone who set us up with the apiary boxes. I remember there being chunks of honey comb around the kitchen from time to time, and there once being a dead bee in it. What a great picture! Are you interested in keeping bees otherwise? As James remembered from his childhood, I’m mainly interested in honeycomb. I don’t know the difference in domesticated vs. wild bees. I suspect these bees were from a hive in which the beekeeper failed to make his/her splits; taking some of the bees away before they ‘split’ on their own.